Absence of adequate screening procedures respecting the dignity and rights of civilians. Current operations in west Mosul offer lessons for Raqqa on the coalition’s decision to encircle and “annihilate” ISIS in Mosul’s al-Qadima (old city). On May 28, US Secretary of Defense James Mattis announced a shift of military strategy against ISIS from “attrition” to “annihilation.”4Martin Pengelly, “Defense secretary Mattis says US policy against Isis is now ‘annihilation’,” The Guardian, May 28, 2017, https://www.theguardian.com/us-news/2017/may/28/james-mattis-defense-secretary-us-isis-annihilation Parties to the conflict must consider the impact on civilians of an annihilation strategy that would besiege ISIS in an area, along with thousands of civilians who face significant challenges to leaving. 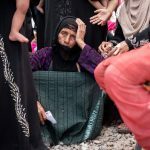 This strategy and its severe consequences for civilians is on full display in west Mosul, as coalition and Iraqi forces have closed in on al-Qadima where ISIS fighters remain along with over 150,000 civilians and face life or death choice: either leave and risk being killed by ISIS shelling and snipers, or stay and risk death from coalition and Iraqi aerial bombing, artillery, and mortars. Such a stark choice must be avoided in Syria and civilians must be given options for safe exit out of active areas of hostilities. Develop and enforce consistent screening guidelines in accordance with international law at SDF checkpoints for displaced persons. According to the United Nations Office for Coordination of Humanitarian Affairs (OCHA) since November 2016 more than 200,000 people have been displaced as a result of the Raqqa operation and 160,000, including 40,000 children, are estimated to remain in the city. The SDF launched Operation Wrath of the Euphrates in November 2016 to take northern parts of Raqqa governorate from ISIS. The SDF announced the final stage of the operation in April 2017, with the goal of retaking Raqqa city. Subsequent SDF advances against ISIS have been supported by US-led airstrikes, and SDF began operations against Raqqa city on June 6. Furthermore, the US has armed and trained members of the SDF, and some US forces are advising SDF on the ground. Car bombs and suicide bombers as ground forces approach ISIS territory. Kill fleeing civilians and those thought to be working with anti-ISIS forces. In order to minimize harm to civilians still left in Raqqa and other ISIS-held areas, the coalition and the SDF should take all feasible precautions to reduce civilian harm, ensure safe passage for civilians, and implement consistent screening procedures in accordance with international law. In May, the Office of High Commissioner for Human Rights (OHCHR) reported that coalition airstrikes killed 23 civilian farmworkers in eastern Raqqa Governorate on May 14, along with 59 civilians in the ISIS-controlled city of Albo Kamal, in eastern Deir ez-Zor governorate on May 15, suggesting that “insufficient precautions” might have been taken to minimize civilian casualties.8OHCHR, “Airstrikes, ISIL causing civilian casualties in Syria — Zeid,” May 26, 2017, http://www.ohchr.org/EN/NewsEvents/Pages/DisplayNews.aspx?NewsID=21662&LangID=E OHCHR also reported that ISIS fighters had announced the execution of eight men suspected of having provided coordinates for these airstrikes. The fight in Raqqa could also take a toll on SDF ranks who are likely to face similar style of attacks, as noted above, from ISIS to that seen in Mosul with implications on civilian protection due to increased reliance on airstrikes in populated areas to support ground forces. The competency of SDF—a newly created force— to conduct complex operations in an urban densely populated area and minimize civilian harm is also of concern. Acknowledge civilian harm and develop the capability to make condolence payments to affected families by working with the Department of State to identify processes where families harmed by coalition strikes can report incidents to trusted local council members and submitted to the coalition for verification. (Money for this purpose has already been allocated for Syria in the US National Defense Authorization Act). Non-US coalition members should create similar processes to acknowledge and offer assistance to victims. Parties to the conflict are obligated under the laws of war to take all feasible steps to evacuate civilians from areas of fighting or where fighters are deployed and not block or impede the evacuation of those wishing to leave. Mixed messages have been given by the coalition and SDF to civilians in ISIS areas on whether they should stay or risk leaving and be killed or injured. Given ISIS use of civilians as human shields, entrapping them to cause mass casualties, and mining roads, civilians face a difficult choice as to whether to shelter in place or attempt to flee. Furthermore, aid groups have told CIVIC that IDP camps in SDF areas face shortages of water and food. There are also a lack of medical professionals and emergency trauma centers to treat civilians fleeing ISIS-held areas. In Syria, the SDF has advanced to the western and northern fronts of Raqqa city, while airstrikes have damaged infrastructure (particularly of bridges), severely hindering civilians’ freedom of movement. The possibility of fleeing to Deir ez-Zor and further south remains open by crossing the Euphrates River. Should some ISIS fighters be allowed to leave, Deir ez-Zor rather than Raqqa could become the main theatre of active conflict with potential besiegement. 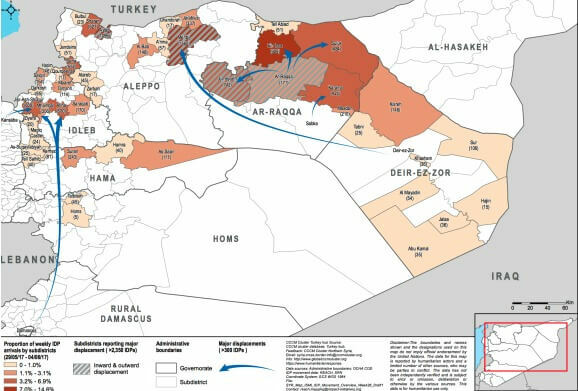 Uncertainty also remains around the role that the Syrian regime troops, pro-regime militias, and Russia might play in the offensive in Deir ez-Zor and how their plans coincide with the US and SDF and what the impact on civilians will be. ISIS is also known to engage in reprisals and retaliatory fire against civilians fleeing areas it controls, necessitating coalition and SDF to provide security to people in safe places. Parties to the conflict cannot leave civilians with no choice for safe exit and must assess all tactics as they advance towards ISIS. Improve coordination with humanitarian agencies to enable them to provide critical assistance, including food, water, medicine, and trauma care. 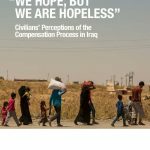 Civilians leaving ISIS-controlled areas are screened at SDF and YPG controlled checkpoints before moving to IDP camps or, if allowed, to move to other parts of Raqqa, Hassakeh or Aleppo governorates.13Conversations with humanitarian organizations, May-June 2017. Reports have emerged of forced conscription at checkpoints, confiscation of identification documents by camp administration after screening, and mistreatment of alleged ISIS members or sympathizers.14Ibid. Investigate allegations of arbitrary detention, ill-treatment, and torture of detainees and hold perpetrators accountable. Your donation allows us to speak to civilians firsthand, bring their voices to the halls of power, and offer practical guidance and civilian-focused policies to warring parties.